The head is one of the only parts of the body we only have one of. And it sits atop the torso like the keystone of an arch. Move the keystone, and the entire arch collapses. Such it is with the golf swing: Move the head and the sequences of the swing begin to lose their integrity. And that loss translates to a clubhead askew in the impact zone. A steady head through impact is a common element you will find in the swings of every professional tour player. As we age though, it does get tougher to maintain a steady head through impact. And every movement, even the slightest, affects movements in the rest of the body which changes the subtle relationships found in a golf swing between muscle groups, nerve endings, and even mental processes. Of course one of the problems is that, without a mirror, we can’t see our own head. My pro, Jim Knego at Bennett Valley, pointed out to me during a lesson that my head moved a good eight inches on the backswing from its starting point. I had no idea. So, since I can’t take Jim with me every time I play, I began to notice carefully the movement my eyes were seeing in relation to the ball from address through impact. I couldn’t really fool my eyes, I surmised, and sure enough, the awareness of movement began to be apparent. I could measure and track my own head movement. The eyes, it turns out, are the surveyor’s transit levels of the head. If you use them as such, the eyes will monitor the movement of the head during the swing. Now such attention to the function of the eyes requires some expertise in the meditative arts. Remember when your second grade teacher use to berate you for not “paying attention?” Well, she didn’t realize it but what she was doing was downright revolutionary. Because paying attention makes up the core of Buddhist meditation. Vision is our most used sense, and in being so, it is the most taken for granted. Golf brings us back to that sense like most ball and club sports will, perhaps more than any other since we are swinging at a stationary object. Should be easy, right? But it’s far from easy. Why? It’s not easy because instead of just acting on the initial senses, like in tennis, there is plenty of time for thought to enter the equation. This is particularly true since there is no defender as in basketball or football, adding an element of the unknown as to how that defender will react. The only defenders in golf, really, are the weather, the lie, and the course itself. Sure, we may have a fellow contender in the U.S. Open, or a five dollar Nassau opponent, but those opponents are not necessarily in our mind’s eye when stand over to address the ball. Hopefully, we are totally and irrevocably within our own body and mind. So, at that moment of address, after our strategy for the shot has been planned and we are committed to the shot, we clear the mind and focus only on what the eyes see. Which is…the ball (although I did teach a blind fellow to play years ago in New Hampshire, and had him use mental imagery to see the ball, and use that image to keep his head still). Now, as you start the backswing you can see if the head is moving laterally or vertically by noticing how it has moved off the axel of the eyes. Of course, to remind yourself of the correct positions, take a couple of practice swings to bring attention not so much to your swing but to the eyes and their importance in the awareness of the head’s movement. 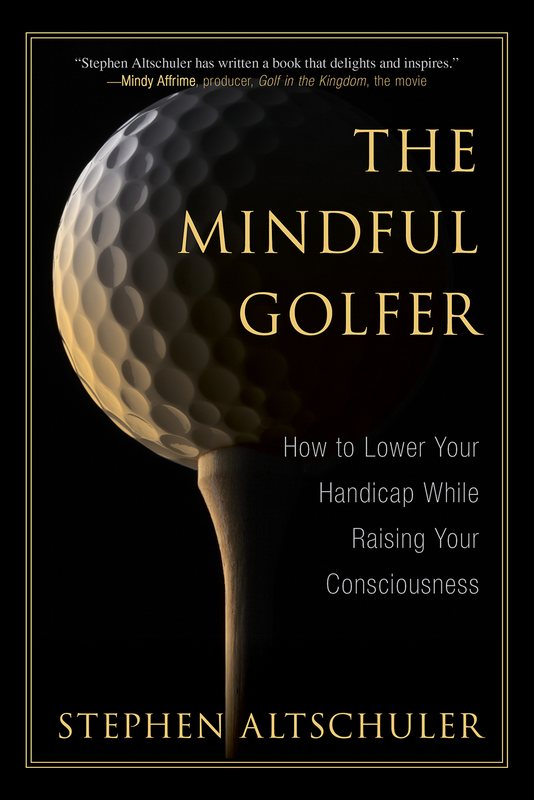 With a steady head, and proper ball position, as I discussed last week, many things that need to happen in a golf swing happen naturally without the necessity of memory. The driver naturally strikes the ball on the upswing; and the irons and hybrids naturally hit the ball first then the earth as the clubhead is descending down and through, making a divot in front of the ball. South African Retief Goosen, winner of two U.S. Opens, reports that when he was a boy, his teacher used to literally hold his head in place when he swung. So now you know the real origin of the expression, “Keep your eye on the ball.” Yes, Virginia, the Buddha did play golf, or a reasonable facsimile of, 2500 years ago. OK, my brother Hank and I both blew our predictions for first half leaders of the U.S. Open. He, Day. I, Rory. We’ve both now recalculated, as the GPS lady says, and the two Nostradamus brothers are now going with, he, Casey; and I, Koepka. But both of us are really pulling for Rickie. Enjoy the action. Am off this week on a buddies trip to Bandon Dunes Resort to play my favorite golf courses in the whole world, including Tom Doak’s masterpiece, Pacific Dunes; and Coore and Crenshaw’s Bandon Trails. Walking is mandatory. Will report upon return. Have fun in Bandon! Haven’t been, but Ballybunion is still fresh in my Buddist mind thirty years on. Great and holy courses do stick in the mind, don’t they, Jeff. The courses at Bandon are like that. Walking them, you begin to feel their essence with your feet, which greatly adds to what your eyes take in. I’d recommend you make the trip to Bandon one of these years. It’s all there, waiting for you. Have a lovely time at Bandon. My favorite place to play golf as well. Birdies to you my friend. Thanks so much, Bucky. Can’t wait to get back to Golf in the Kingdom. You and I should make that trip at some point. Hi. I enjoy your blog. Your book is on my must-read list. I’m 67 and in the process of resurrecting my golf swing after a layoff of a few years. It’s coming, but there are times when the checklist in my head (alignment, ball position, takeaway, etc etc) becomes like a chorus of voices (add one now for keeping my head still). It seems to be as far from mindfulness as one can get. I know my true, good swing is in me somewhere. How can I quiet the noise and just do it? I enjoyed your comment, Craig. Always like hearing of a revival of interest in this great game. It is daunting, isn’t it? So many things to remember, and their sequencing, and the reaction of our bodies to the stresses it presents. But then…there is that one shot where perfect contact ensues the ball soaring straight and true as our eye scans vertical, tracking its flight dead on the pin, watching as it finally settles like a dragonfly on a marsh reed. That moment where we see the possibilities, and directly experience the realities of the pleasures this game can bring. How to quiet the noise and just play like you were just starting as a boy? There’s a great book called Zen Mind, Beginner’s Mind that describes how to stay in the moment, unburdened by thought. Your challenge is to attain a swing you can repeat as reliably as possible. Most of us will never achieve the grooved swing of a pro, but we can get better as we continue to stay with the game, come hell or high water. Learn the basics. See what works for you and your body. Take some lessons, if need be. And keep whittling that stick down to where it starts looking like something you can be proud of. Eventually, the thoughts will settle like the filtrate in a test tube, and you will swing more and more freely. All the best with your game, Craig. Thanks for writing. The amount of head movement in a good golf swing action depends mainly on where you position it in the First Place! Most amateurs above 7 handicap position their head center to left of center caused by right eye dominance and wanting to hit at the ball with the clubhead.